Bacon Parmesan Gougeres - cheesy and savory Gougeres or French cheese puffs recipe. Every bite is loaded with bacon bits and Parmesan cheese, so good! I have recently discontinued the hot food and snack meal plan at my son’s pre-school because he just didn’t eat and completely wasted the food on a daily basis. As a result, I have been packing lunch box and snack for him every day. 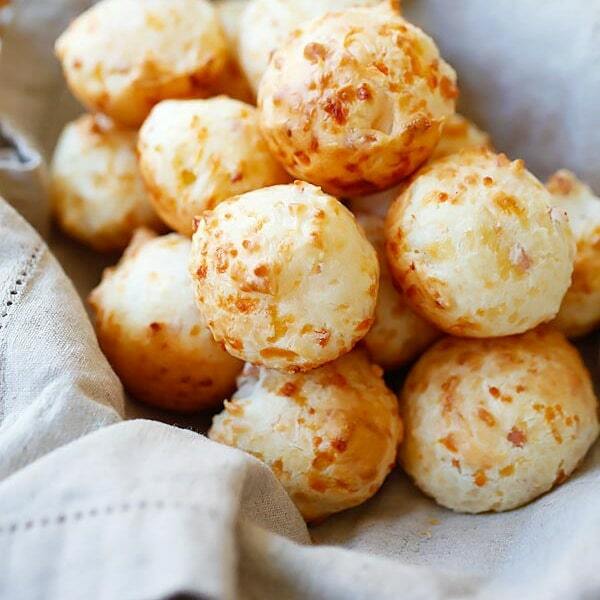 For his snacks, I have been baking simple breads and cheese puffs for him, for example: cheesy garlic bread, mini monkey bread, gougeres or French cheese puffs, Brazilian cheese bread, choux pastry, etc. All these snacks are so easy to make and I can make them in a jiffy without baking up a storm in the kitchen. More importantly, we love all those breads and puffs! I have been remaking the regular gougeres recipe in my archive for a few times and little G seems to get bored of it. I have a recipe saved from Fine Cooking magazine from earlier this year on Bacon and Parmesan Gougeres. This past week, I decided to give the recipe a try. Little G loves bacon (both regular and Canadian bacon) and cheese, so I was almost 100% certain that he would love these cheese puffs as his afternoon snack. I ran out of regular bacon so I used Canadian bacon to make these gougeres. I diced them up into small bits and then mixed them with the dough. I love it that every bite is a hidden treasure of the bacon; the cheesy gougeres tasted rich, savory, and absolutely mouthwatering hot off the oven. We enjoyed them a lot. Have a wonderful week and hope you get to try this amazing Bacon Parmesan Gougeres cheese puffs recipe soon! Bacon Parmesan Gougeres – cheesy and savory Gougeres or French cheese puffs recipe. Every bite is loaded with bacon bits and Parmesan cheese, so good. Cook the bacon in a large skillet over medium-low heat until crisp but not too dark. If you use Canadian bacon, just dice into small pieces. Transfer the bacon to a plate lined with paper towels, and reserve 1/4 cup of the rendered fat. When the bacon is cool, chop to make 1/2 cup. Bring the milk, 1/2 cup water, the butter, and the reserved bacon fat to a simmer in a medium saucepan over medium heat. Stir in the salt, onion powder, sugar, and cayenne. Add the flour and, using a wooden spoon, stir very quickly in one direction. The flour will quickly absorb the liquid and form a dough. Continue stirring to cook the flour and simmer off more of the moisture until the dough pulls away from the sides of the saucepan, an additional minute or two. Add the eggs one at a time, mixing on medium speed until each is incorporated into the dough, which will change from shiny to sticky as the eggs are worked in. On low speed, stir in 1 cup of the Parmesan and the bacon (or Canadian bacon) until just combined. Can’t wait to try making this! I love cheesy bread! Sounds really good. Can’t wait to try. Is there any way you could list calories and things? I would recommend adding an herb to this recipe – such as oregano; but overall I think it lacks flavor and I even added a clove of garlic w/ kosher salt to make a paste, and used 3 different cheeses for flavor: parmesan, pecorino and sharp cheddar. I used canadian bacon as well and used 5 pieces.